PhotoPeach FAQs: Q: Can I remove comments from a slideshow? Q: Can I remove comments from a slideshow? A: Yes, on your slideshow, you can remove any comments individually at "Manage Comments" in the edit menu. 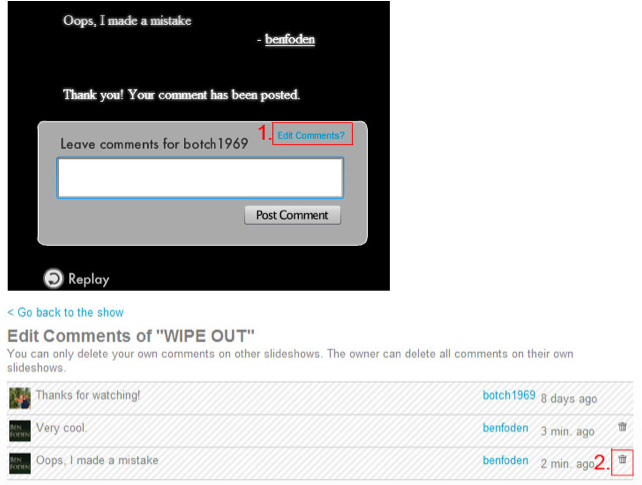 Also, you can remove your own comments on someone else's slideshow if you made a mistake as shown below. 1) Click the "Edit Comments?" button at the end of the slideshow. 2) In the comments list, click the trash can icon for the comment you wish to delete.